The ANSI Smalltalk standard defines SIF, Smalltalk Interchange File, which is a common format for Smalltalk dialects to exchange file-outs. Eric Arseneau implemented SIF for Squeak (some old version), Dolphin (v2! ), VisualWorks (v3!) and VisualAge Smalltalk (v4!) back in 2000. The implementation is found here. 15+ years later, the implementation files in cleanly on Squeak v5, Pharo v4 and Dolphin v7. Let's see if I can use this to quicken the port of NBSQLite3 from Pharo to Dolphin. I'll test with moving a single class, NBSQLite3Backup. First, file out from a Pharo workspace. Then, file in from a Dolphin workspace. Remove the "self nextPut: $#" line, accept the change. File out from Pharo, and try to file into Dolphin again. NBExternalResourceManager is a NativeBoost thing and does not exist in Dolphin. To fix, edit the SIF file and remove that line, preserving the chunking. File in again. Debugger again. This time Dolphin complains that NBSQLite3DatabaseExternalObject is undeclared. In Dolphin all FFI handles are instances of ExternalAddress. Edit the SIF file to that effect. NBSQLite3 is a C library wrapper with dialect-specific FFI calls. As such porting it is slightly more involved. I suspect that "pure" Smalltalk code written portably should be much easier to move between Pharo and Dolphin, or between any two modern dialects of Smalltalk. 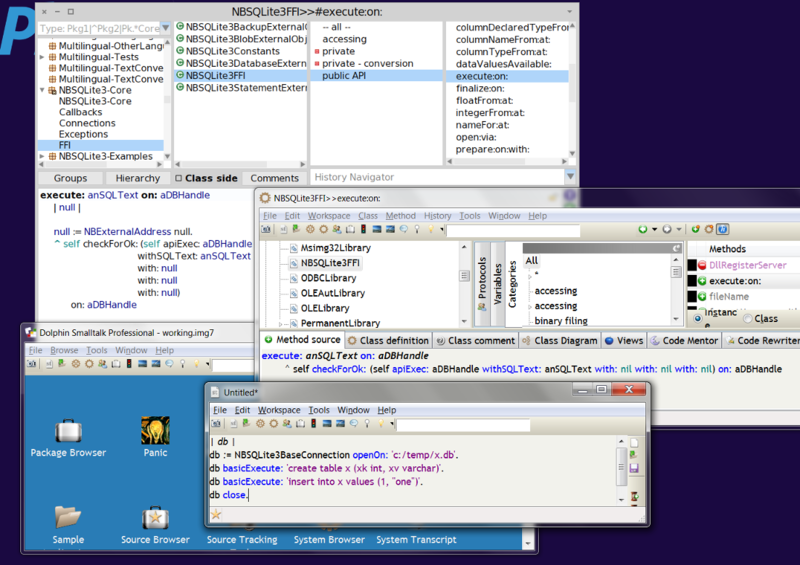 Dolphin Smalltalk 7 has been released as open source. Many thanks to Object Arts.